Recently, the CEO of Levi’s recommended that you never wash your jeans. To prove his point, he showed up in a pair of Levi’s that are year old and never been washed. The idea is that the more you wash your jeans, the more that are going to fade. What happens if you spill something on them? You could do a spot cleaning with a little vinegar. If those jeans are starting to smell “ripe” then hanging them to air dry could solve that problem. You might even try freezing them to kill off the bacteria. Someone even suggests taking a shower while wearing your jeans. Does this mean you should avoid washing all your clothes? Probably not. Denim is a certain breed of fabric that requires special care. On the other hand, if your washing machine has seen better days then it might not be getting any of your clothes clean. That might mean it’s time to replace those appliances. First, you need to assess if your washing habits have changed. What a single person needs in a washing machine is a lot different from what a family will need. If you’ve expanded the amount of people in your household then your laundry capacity should expand as well. The good news is that the modern washing machines will not only handle more clothes but they are more energy efficient. You’ll be able to program your cycles to get the maximum benefit from each laundry load. That also holds true for your dryer. The moment you’ve settled on your new models, you’ll need to arrange for your old washing machine and dryer disposal. That can be taken care of with a quick call to Junk King. These are the junk removal specialists who take all the stress out of hauling away large appliances. In fact, if you’ve got anything that won’t fit into a trashcan, then you’ll want to turn it over to Junk King. They’ll be sending over a two-man moving crew and truck big enough to cart away whatever you’re tossing out. The Junk King crews have also been trained in the proper techniques for unhooking washers and dryers. Remember, these are professional junk haulers and that will make all the difference in terms of quality of work. 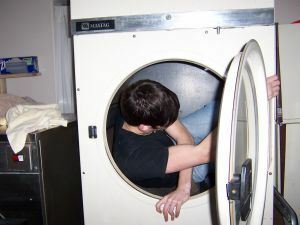 Junk King makes old washing machine and dryer disposal a simple and fast task. This entry was posted in Denver Old Washing Machine and Dryer Disposal and tagged Denver Old Washing Machine and Dryer Disposal, Junk King on May 30, 2014 by Paul Durant. Last updated August 1, 2017 . There is a popular home makeover reality show that has the host trolling the aisles of local Home Depot stores in search of homeowners. When the host spots someone who is shopping for their yard, they make an offer of a complete landscaping makeover. What follows is 48 hours of intense work with a small army of volunteers doing all the digging, building and landscaping. It’s great to see the “before and after” of these back yard projects. It’s enough to make you want to roll up your sleeves and turn your backyard around. Sadly, you might be stuck with doing most of the work yourself without a camera crew in sight! However, you don’t have to be totally alone. Junk King is standing by to help with all kinds of back yard clean up tasks including shed removal and breakdown. There are many types of backyard sheds that are used by Denver residents. Shed design can be modular plastic or wood. It’s those wood structures that often require replacement. That’s because no matter how well they are constructed, they simply aren’t as durable as your home or garage. After years of brutal winters and blistering summers, that wood is going to start to rot. When that happens, it would take much to bring the whole structure down. 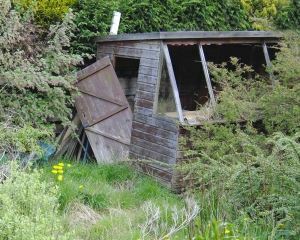 Before it gets too bad, you might want to bring in Junk King to handle the shed removal and breakdown from start to finish. When you call to set up your appointment with Junk King, give them the heads up that you want help with shed removal. As soon as the Junk King crew arrives, they’ll get busy with their hammers and crowbars to take down that shed piece by piece. It will all get loaded up on the back of the Junk King truck for proper disposal. All of that will happen with your exerting one bit of effort. As long as they are taking down a shed, the Junk King crew can also dismantle a swing set, above ground pool, hot tub or BBQ grill. No junk removal task is too big or too small for Junk King. All the debris from your yard that is collected by Junk King could even end up getting recycled. That means you can lower your carbon footprint and have a cleaned out yard all in the same appointment. Shed removal and breakdown is easy when you let Junk King do all the work. This entry was posted in Denver Shed Removal And Breakdown and tagged Denver Shed Removal And Breakdown, Junk King, Shed Removal on May 20, 2014 by Paul Durant. Last updated August 1, 2017 .